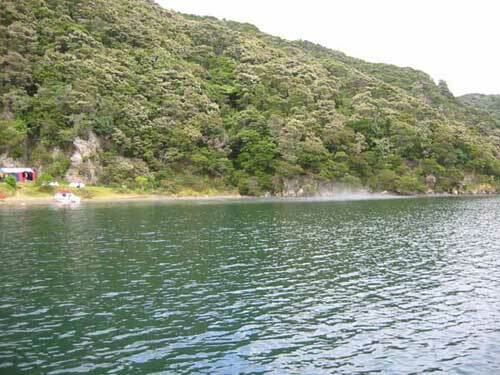 Situated in the western corner of Lake Tarawera. The hot spring trickles down a small stream and into the lake. As you can see in the picture, you may need to work at collecting large rocks and place them in a circle to keep the hot water in. Rather labour intensive and the sandflies are very annoying! Easiest access is by boat – just look for the steam! Map showing location of Te Rata Bay (Hot Water Beach) . Use the controls on the map to zoom in and out. I've been here once, and that was enough. To get to this remote Lake Tarawera beach involved 30 minutes driving, 45 minutes off-roading (in a non-off-road-worthy car!) and another 45 minutes tramping! As shown in the 1st photo above we built a little ring of rocks to hold some of the hot water in, but for all the blinkin sandflies, driving, tramping and labour, it wasn't really worth it. What a disappointment!! The walk along the new track was great, it was new, had good signage and toilets along the way, well done, plenty of money spent on that. Nice stop on the lakeside along the way. However the pleasure of it all ended when we got to the lake. No signs...where do we go? Tried along the beach but that ended at the water, then we ended up wandering in the trees along goat tracks that were not marked and through a bit of litter left behind by lazy campers till we reached the campsite. Don't understand why the rest was so well marked and then a FAIlL when we got near the destination. The campsite was fine but the lake was a huge disappointment. Out front of the campsite it was full of lakeweed. People had pulled loads of it into piles which were decaying and it just looked rank. Some kids showed us their very nasty rashes all over their legs that they said they got from the lakeweed, very nasty, really there should have been a warning it was so painful looking. So no soaking in front of the campsite. Further down where there is no weed, it was very shallow and either too hot from the the water coming out of the sand or too cold. it really wasn't somewhere as they had advertised as having a soak in the warm waters. You could only stand in it and try and find a patch that didn't burn your feet. It was either too cold or too hot. We took the water taxi out the next day and they took us to some other hot pools. This was created by a small dam and very pleasant but was many other boaties were there it was very crowded and it was only about knee high in depth so it was like being in a warm bath with a lot of people. It appears the advertising of this spot sounds idyllic soaking in natural hot water springs in nature on a lakeside. The reality is not, slimy weed, shallow water, burn your feet. Everyone in the campsite said that it was Ok if you were spending your time there if you had a boat and did some waterskiing but just for the hot pools, nope not the place to go. Definately wouldn't recommend it. I believe this place has been quite falsely advertised. Best way to see it is to walk there on the marvellous track either from the car park or The anding, & get one of the water taxis to meet you at Hot water Beach. Then get them to take you to some more hot pools only accessible by boat. These pools have a more consistent temperature. 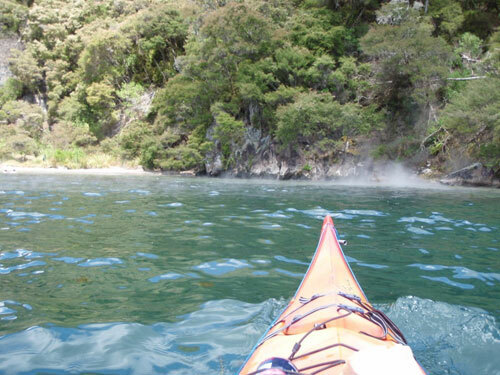 Finish it with some rock jumping & a swim in the silky water of Lake tarawera before being dropped back at The Landing. 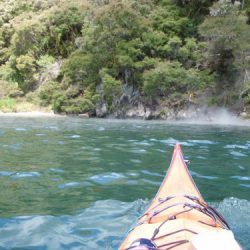 For a tailored boat trip google "The Fat Pigeon" or for a water taxi "Lake Tarawera eco tours"
What is billed as being one of New Zealand's best walks will open this weekend, with upwards of 30,000 hikers per year expected. 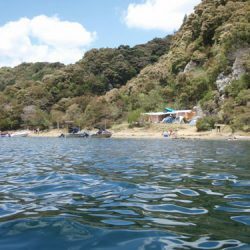 The Tarawera Trail will make the favourite picnic and camping spot of Hot Water Beach on the edge of Lake Tarawera now available for walkers and hikers - albeit with a little effort. The collaborative project has taken over nine years of negotiations and development, with 11km of trail from the Te Wairoa car park to Te Rata Bay (Hot Water Beach) now complete. The one-way walk is expected to take moderately fit walkers around 4-5 hours to complete. 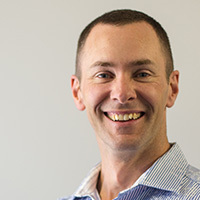 Tarawera Trail Trust trustee Te Ohu Mokai Wi Kingi says the opening of the trail is a great asset for Rotorua with the trail set to become one of New Zealand's greatest walks. "We're expecting 33,000 people a year to walk the trail - or around 90 people per day." Panels along the trail will educate walkers and hikers about the history and ecology of the area. 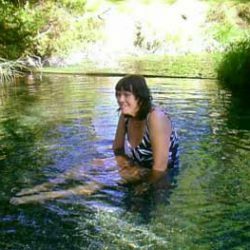 "The trail is a perfect addition to the region as it has a low impact on the environment and ensures tangata whenua, as kaitiaki of the area, continue the stories of their forefathers." In October this year the trail was honoured by the gift of a carved wooden Pou, Ohomairangi, by Tourism New Zealand and Te Puia|NZMACI, acknowledging the local hapu, Ngati Hinemihi and Tuhourangi's significant contribution in establishing New Zealand's tourism industry. Ngati Hinemihi and Tuhourangi were New Zealand's very first hosts, welcoming and guiding domestic and international visitors to the Pink and White Terraces on Lake Tarawera. The official opening powhiri and ribbon cutting is on December 14 with the trail open to walkers and hikers on 15 December. 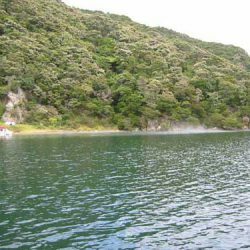 The Tarawera Trail is the first of the proposed network of trails, planned for development in the future, involving DOC and Maori private land owners to connect the 14 Te Arawa Lakes in this area. Beautiful peace of hidden paradise. Sit and relax on the beach, swim or wake board. The hot pools were something we were looking forward to see. The temperature can vary from being cold to boiling hot. Definitely worth going to and we shall be returning again but this time with insect repellant!!! 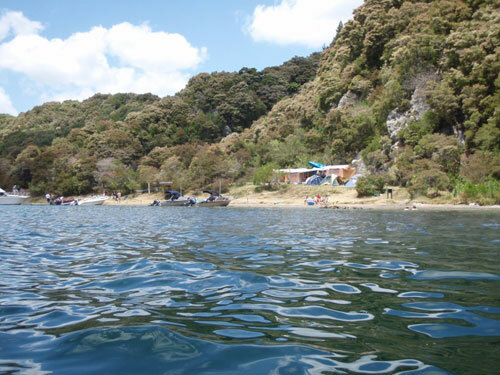 Based at a DOC water access only campsite at the southern end of Lake Tarawera. Popular with families with water taxi access. Water edge is thermal. 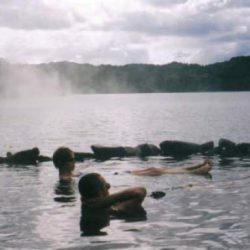 There is a hot stream merging with the lake water surrounded with rocks that form the actual pool. Can cook trout in the nearby sand. There is a small rock edge and stream thermal pools nearby. This is a truly beautiful spot, however we found it really difficult to find a spot in the lake where the water wasn't either freezing or unbelievably boiling hot. This is still worth a trip though. You can lie in a small man made rock pool if it's free...just a few people were there the day we went...so if you can get in a rock pool or make one to keep the temperature more controlled you will enjoy this experience. Beware the close you get to the cliffs the more boiling the water is. Ask anyone who's there to help you get into the water as you may get a real fright from the heat. Ease your way in from the beach then slowly across to the cliffs where you'll see the water trickling down into the lake. A beautiful spot as I said, and amazing view of Mt Tarawera. I also understand you can camp the night. boat access only! we have been coming here for years now and absolutly love it. for us it is definatly our family holiday spot. we love jumoping off the rocks around in the next bay and sitting in the hot natural spa. an awesome spot to relax, wakeboard, ski, skurf and just swim. if your up for the challenge swim to the boy about 200m out. overall of the best places in new zealand!!!! 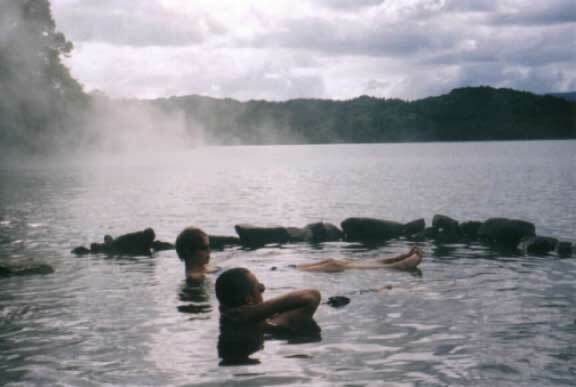 We have been going to Lake Tarawera for holidays for more than 10 years. 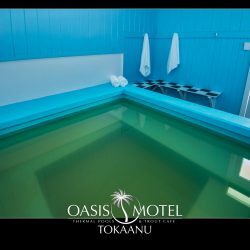 We are waterskiers so for us one of the highlights is a soak in warm/hot water after a days skiing to soothe the worn out bodies. Hot water can be found along most of the beach. Stand at water level, wriggle your feet and If not careful, burnt feet can result. At the western end of the beach, hot water is present from depth, not just the stream. Its a matter of finding the interface between hot and cold sections for bathing. Unfortunately the interface can be quite sudden so it can be difficult to find comfort between the too hot and the too cold. There is no road access, so is typically accessed by boat. The camping area there is administered by Dept of Conservation (I think) and is very popular during summer holidays.